Researchers of Karlsruhe Institute of Technology (KIT) have developed a novel, even more economical LED street light. They replaced conventional high-performance diodes by a special array of weaker LEDs and, thus, succeeded in reducing power consumption by another 20%. As a result, CO2 emission is decreased and municipalities might save millions of power costs. Pfalzwerke Netz AG, the local utility company, for the first time equipped street lights with the new light heads in the municipality of Maxdorf, Rhineland Palatinate. “We have succeeded again in significantly increasing the efficiency and service life of our lamps compared to conventional LEDs,” says Michael Heidinger of KIT’s Light Technology Institute (LTI). He designed a smart circuit that compensates aging and failure of individual light-emitting diodes. Parallel connection of a large number of LEDs is difficult, as failure of a single diode will cause failure of the complete system or section – a phenomenon known from Christmas light chains. The alternative of connecting LEDs in series also has drawbacks, as the voltage required increases with the number of diodes used. As the legally permissible contact voltage is limited to 120 volts, only up to 40 LEDs have been connected in series so far. Now, it is possible to install a large number of LEDs – 48 in the light modules used here – on a single board at low cost. Moreover, the LEDs increase safety, because the new switching concept of Heidinger is operated at voltages of 20 volts compared to the usual 120 volts. In future, cities and municipalities might profit from reduced power consumption of the novel type of LED. At many places, the old, conventional, and highly power-consuming illumination is being replaced by LED technology at the moment. According to the utility company of Karlsruhe, illumination of this medium-sized city with about 320,000 inhabitants requires about 55.000 lamps (35% of which are LEDs). Their power consumption totaled about 10,800 megawatt hours in 2018, resulting in annual power and maintenance costs of EUR 3 million. And additional reduction potentials are high. “If all street lights will be equipped with novel LEDs, cost reductions of up to 30% will be possible,” says Stefan Lang, who is responsible for technology and innovation at the Pfalzwerke utility company. In addition, the first lamps of this kind have luminous characteristics that are more comfortable for the human eye. “Many small LEDs are perceived as panel radiators from a certain distance. 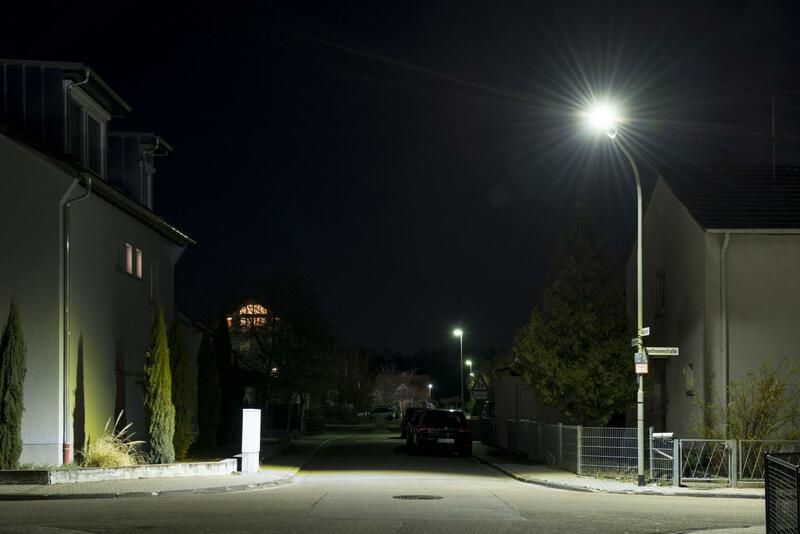 Their glaring effect is smaller than that of high-performance LEDs that are perceived as spot-like light sources,” says Klaus Müller, Managing Director of Gratz Luminance GmbH, the company producing the new outdoor lights in Weinberg, Baden-Württemberg. And they are cheaper to purchase. Low-power LEDs are cheaper than high-power LEDs, as a result of which the new system can be produced and offered at reduced costs, although more light-emitting diodes are required. Last but not least, change to the new lamp technology is uncomplicated and inexpensive. “Our light head can be installed onto existing poles,” Müller says. Now, the street lights will be tested in Maxdorf. Also other municipalities are interested in the technology. Series production is being prepared. “We hope that we can offer the lamp to selected pilot customers in the second half of 2019,” Müller adds. Being “The Research University in the Helmholtz Association,” KIT creates and imparts knowledge for the society and the environment. It is the objective to make significant contributions to the global challenges in the fields of energy, mobility and information. For this, about 9,300 employees cooperate in a broad range of disciplines in natural sciences, engineering sciences, economics, and the humanities and social sciences. KIT prepares its 25,100 students for responsible tasks in society, industry, and science by offering research-based study programs. Innovation efforts at KIT build a bridge between important scientific findings and their application for the benefit of society, economic prosperity, and the preservation of our natural basis of life. This press release is available on the internet at http://www.sek.kit.edu/english/press_office.php.